I hated English Literature at school, and duly responded by failing my O-level. From what I can remember, the syllabus consisted of an obligatory Shakespeare (in my case, Twelfth Night), something by one of the Brontës, and shitloads of Robert and Elizabeth Browning. 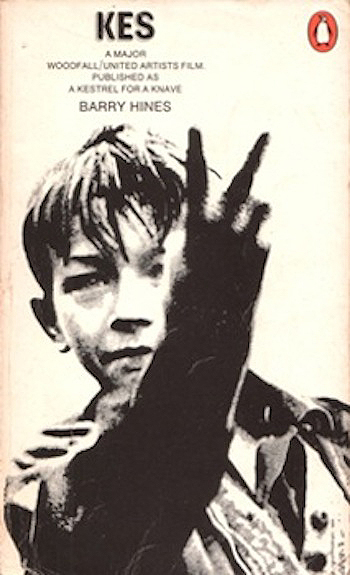 This may have been partly determined by me being in a ‘grammar school’ stream (which had continued to operate under the comprehensive system recently ushered in by the Labour Party), as I also recall being envious of a ‘secondary school’ stream who were reading Barry Hines’ A Kestrel for a Knave, with its brilliant and iconic 70’s cover. The announcement of a shift towards a more Anglicised and pre-20th century GCSE syllabus seems to be taking us back to the seventies and eighties, when incidentally – in choosing not to continue studying it for O-level – my History education also stopped somewhere around the Middle Ages. It also appears to be directly influenced by Michael Gove and an educational policy seemingly hellbent on a ‘back to basics’ rhetoric to appease the Tory right and massage his future leadership ambitions. As such, the announcement was received by typically mixed responses of incredulity, anger and bemusement from the educational community. But it reminded me that when I left school, and started reading books of my own choice, it sparked a new and voracious appetite for literature that was initially fuelled by American mid-20th century classics such as To Kill a Mockingbird and The Catcher in the Rye. These may have become clichéd teenage cult novels, but they helped form the basis for a self-directed literary education (of sorts), which rapidly expanded to include the works of Steinbeck, Hemingway, Faulkner and many more. It’s interesting to recall the cultural landscape in which this occurred: a period of self-discovery which corresponded with a growing exploration and awareness of not only books, but of music and film, primarily mediated by the NME, fanzines and several like-minded individuals in my peer group. These days, such resources are massively multiplied, distributed and (to an extent) democratised through the participatory culture of social media, through online networks and reading groups, often manifest in lists, recommendations and other explicit and sometimes vacuous expressions of shared cultural capital. Perhaps it is partly the role of formal schooling to create a stale and repressive environment that might initiate informal, self-motivated and alternative learning cultures and trajectories, but I’m mindful that there are too many young adults who stop reading books entirely when they leave school. So it’s hard to justify an increasingly restrictive and archaic syllabus at the expense of geographically inclusive and culturally diverse literature that might just help cultivate a lifelong passion for reading. In his highly readable book What is Education?, Philip W. Jackson, Distinguished Service Professor Emeritus at the University of Chicago, attempts a total rethink of education ‘from the ground up.’ Taking a John Dewey lecture from 1938 as his lead, he proceeds to drill down into what is the ‘essence’ of education. Jackson builds his arguments around a series of largely corresponding dialectical relationships, primarily drawn from Kant and Hegel, from Dewey himself, and from the theologian Paul Tillich. Jackson here is blurring the distinction between primary and secondary, and physical and symbolic sources of knowledge, whether they are realised through the student’s direct relationship with a supportive teacher, or through the inspirational words of a dead philosopher. This challenges the notion of ‘informing’ texts (or, if you prefer, learning content) as neutral artefacts that are utilised by teachers who exclusively provide the transformative process of shaping student understanding. Indeed, when considering the potential cultural baggage that comes with the mimetic tradition, Jackson’s initial attempt at a definition of education as “a socially facilitated process of cultural transmission” (10) is useful. This raises some interesting questions regarding the social web. How might that social facilitation be disrupted by a student’s increased appropriation of distributed and multimodal forms of content, by her access to a wider range of sources of expertise, and by her engagement in more participative forms of content production? And what if any, do increasingly self-directed and participatory forms of enquiry contribute to the apparent blurring between the mimetic and transformative traditions Jackson describes? One can assume this is diminished as students progress into postgraduate study and enter academia themselves. So how might the increased complexity, informality and connectivity we associate with the social web influence this act of conceptual distancing? I’ve discussed previously the potential role of social media in signposting the complex social and cultural interrelations underlying contemporary academic discourse. Further, how might the student develop and refine her conceptual distancing as she progresses into postgraduate and doctoral study, and engages in the reciprocal processes of identity transformation and recognition in her chosen field? Jackson, P. W. (1986). The practice of teaching. New York: Teachers College Press. Jackson, P. W. (2011). What is education? Chicago: The University of Chicago Press. de Saint-Exupéry, A. (1939). Terre des Hommes. Paris: Gallimard. This makes a lot of sense. But from a learner’s perspective – and maybe I’m drawing too much from socio-cultural perspectives here – it often seems that we need to become skilled in the former to be able to gain access to the latter. In researching approaches to digital identity, I recently came across a model which I found particularly interesting. In their schema of experiential learning, Usher, Bryant et al. 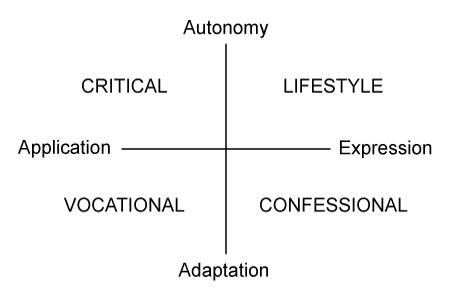 (1996) describe how lifelong learning can be understood in relation to two continua (autonomy to adaptation, and application to expression) which create four specific contemporary social practices: lifestyle, confessional, vocational, and critical. Drawing largely on Foucault’s notion of the ‘confession’ – which they describe as a “ritual that unfolds within a power relationship” – Edwards and Usher (2001) argue that in a confessional practice, the learner adopts the dominant socio-economic environment. In a process where the “externally imposed discipline has given way to the self-discipline of an autonomous subjectivity,” (12-13) the learner is disempowered in accepting the dominant (or often solitary) model of learning, aligning his subjectivities with formal educational discourses to articulate his own learning needs. Here, the pedagogic emphasis is on self-improvement, self-development and self-evaluation, which Tenant (2009) observes is particularly manifest in learning plans and portfolio development. This promotes a modernist notion of identity; one that is stable, unified, coherent and developmental. Critical perspectives argue that – unlike in the confessional practice, where empowerment is illusory – practice authenticates empowerment through self and social transformation. Autonomy is achieved through questioning, challenging and potentially changing (rather than adapting to) particular learning contexts. Meanings are not a given, but are produced through discursive practices (Tenant, 2009). Corresponding literature on critical pedagogies emphasises the politics of representation in the cultural processes of learning and education, and sees representation of self as a socially and politically constituted agent that shapes identity formation. Edwards and Usher (2001) see critical practice as promoting a postmodernist perspective which understands culture as an ongoing process, in a state of constant flux, and recognises that identity can be multiple, fragmentary and pseudonomic. So how does identity formation within these two practices translate to the formation of digital identities and reputations, and to the representation(s) of self on the social web? Edwards, R., & Usher, R. (2001). Lifelong Learning: A Postmodern Condition of Education? Adult Education Quarterly. 51, 273-287. Tennant, M. (2009). Lifelong learning as a technology of the self. In Illeris, K., Contemporary Theories of Learning. London: Routledge. 147-158. Usher, R., Bryant, I., & Johnston, R. (1996). Adult Education and the Postmodern Challenge: Learning Beyond the Limits. London: Routledge.